Traditional and Empirical Use: Arjuna is a popular Indian medicinal plant, its bark being used as a cardiotonic agent from time immemorial. This well known heart tonic is used extensively in cardiac debility and is best known for its special properties of strengthening the muscles of the heart and subsequent improved pumping activity of the heart. Its blood coagulating properties are extremely useful in arresting bleeding. A decoction of the bark is used to wash ulcers and is taken internally for liver congestion and as an antidote to poisons, especially snakebite and scorpion stings. The juice of the leaves is a remedy for earache. For fractures, with excessive bruising, the powdered bark is given internally with milk. 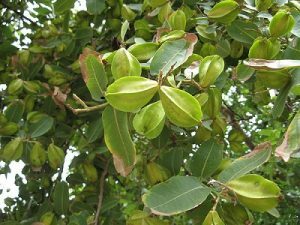 The bark, leaves and fruits of arjuna have also been traditionally used for urinary discharge, strangury (painful passage of small quantities of urine), leucoderma (white patches on the skin), anaemia, sweating, asthma and tumours. Arjuna is also used traditionally in the treatment of red and swollen mouth, tongue and gums, dysentery, skin eruptions, pains, fatigue, diabetes, bronchitis and obesity. It effectively controls menstrual disorders such as menorrhagia and leucorrhoea caused by a laxity of the uterus. Energetics: The Taste (Rasa) is astringent and bitter; the Energy (Virya) is cooling with the post-digestive effect (Vipaka) pungent; the Quality (Guna) is light (laghu) and dry (ruksa); the target tissue (Dhatu) is blood, bone and reproductive; the Channels (Srotas) are circulatory and reproductive. It affects all Dosa and purifi es excess pitta from the blood. It alleviates the kapha and pitta dosas but vitiates (impairs) the vata dosa. Constituents: Triterpenoids, including arjunin, arjunic acid, arjunolic acid, arjungenin, and terminic acid. The bark also contains glycosides, including arjunetin, arjunoside I, arjunoside II, arjunaphthanoloside and terminoside A; sitosterol; flavonoids, including arjunolone, arjunone, bicalein, luteolin, gallic acid, ethyl gallate, quercetin, kempferol, pelorgonidin, oligomeric and proanthocyanidins; tannins and minerals. The bark also contains large amounts of carbonates of calcium and sodium. Actions: Cardio-protective, heart tonic, hypotensive, hypolipidaemic, inotropic (changes the force of the hearts contractions), antioxidant, anti-inflammatory, cytoprotective, antiulcer, apoptosis inducing, antidiabetic, antibacterial, antiviral, vulnerary, astringent, febrifuge, demulcent, expectorant. Indications: Chronic cardio-vascular diseases, including chronic, stable angina, mild congestive heart failure, weakness of the heart, hypercholesterolemia, hypertension and metabolic syndrome; adjuvant during chemotherapy; antioxidant therapy in diabetes; gastric ulceration; difficulty in urination; general detoxification; and externally arjuna is used to improve wound healing. Toxicity: Mild side effects like nausea, gastritis, headache, body ache, constipation, and insomnia have been reported. No haematological, renal or metabolic toxicity has been reported even after more than 24 months of its administration. High amounts of the plant extract should not be consumed. Use in Pregnancy: Traditionally contraindicated during pregnancy. Contraindications and Cautions: None known. Drug interactions : Arjuna has been used concurrently with statins with good results. Information about interactions with beta-blockers or long term statins needs to be discussed with a health professional before using.